How far back can you trace your family tree? My lineage gets fuzzy around my 5th great-grandmother: Rebecca Ellsworth from New York. Queen Elizabeth (apparently a much better record-keeper than myself) can trace her lineage back to her 32nd great-grandfather: King Alfred the Great of Wessex. But even British royalty have a hard time keeping up with the Confucians. Descendants of this Chinese philosopher have carefully tracked over 80 generations of ancestry. Confucius’ line wins the award for longest documented genealogy in the human race, but expanding the competition to all forms of life knocks them down to a distant, distant runner-up. Evolutionary biologist Richard Lenski at Michigan State University has been running an experiment using the humble gut bacterium Escherichia coli since 1988. 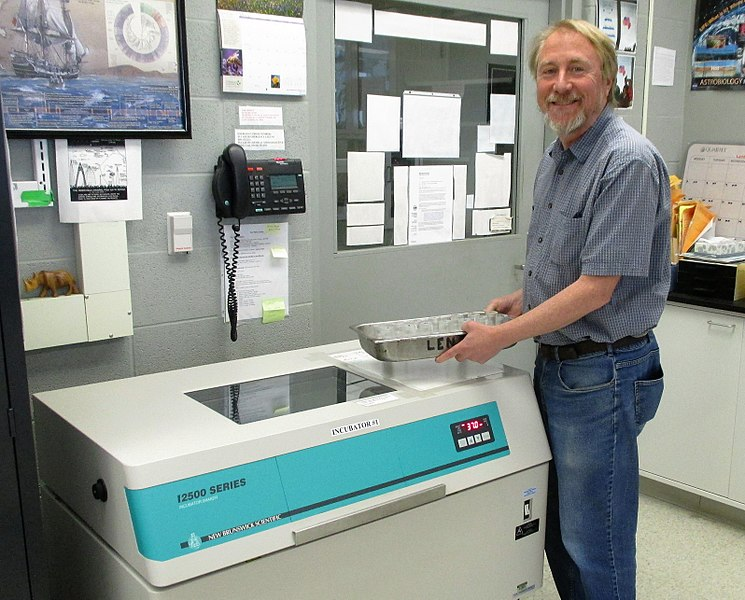 Because these bacteria are capable of starting a new generation about every 20 minutes under ideal laboratory conditions, Lenski’s team has been able to carefully monitor and preserve over 60,000 generations of E. coli ancestry. No human family can possibly compete with these bacteria’s genealogical record… anatomically modern humans have only existed for about 12,000 generations. I only looked into my ancestry because I wanted to know if I descended from someone famous (no such luck). The Lenski lab has an entirely different objective. They understand that each generation introduces change, and that this gradual change is the basis of how all life evolves. How do these changes happen? How quickly do they occur? The Lenski lab uses this tiny gut microbe to answer these big questions. Researchers in the lab continuously propagate and monitor bacterial cultures. Every couple of months (or roughly 500 generations), a portion of the bacterial cells are preserved in freezers alongside all of their ancestors as part of a “frozen fossil record.” But these are living fossils–any one of these cultures can be revived for experimentation and DNA sequencing. Over the course of their experiment, the Lenski team has seen some exciting changes arise. In one extreme example, they observed the evolution of a brand-new trait: the ability to digest a new type of food. The experiment started with 12 slightly different populations, or strains, of E. coli, that all initially arose from a single cell and all used glucose present in broth as their sole carbon source for energy. The scientists grew these strains in broth that contained only a little glucose, but (for technical reasons) happened to have a lot of citrate. Citrate is similar to glucose, but none of the E. coli strains could metabolize citrate the way they did glucose. In the low-glucose environment, these microbes were starving. About 31,000 generations later, 11 of 12 strains still relied solely on glucose for energy to reproduce, but one strain developed the ability to eat citrate too. Consequently, these citrate-using bacteria were able to grow much better in the glucose-poor/citrate-rich media than their 11 sibling strains. Ta da! Evolution happened right there on the bench-top, and simply opening a freezer door could reveal exactly when and how these changes took place. Using their handy frozen fossil record, researchers revived ancestors in the lineage that gave rise to citrate-eating bacteria and showed the steps that needed to happen for this new trait to come about. Humans have experienced evolutionary changes in what we can and can’t digest too. Lactase persistence, an adult human’s ability to digest the milk sugar lactose in, say, a gallon of ice cream if she so pleases, evolved fairly recently. Most mammals can only digest lactose as breastfeeding infants, but some populations of humans retain this ability for their entire lives. We can’t revive and sequence hundreds of generations of humans, so it’s harder to nail down the specifics, but lactase persistence is estimated to have first arisen about 7500 years ago (~300 human generations), shortly after humans figured out how to domesticate cattle (go figure). So, where do these new traits come from? Lenski’s E. coli research supports the idea that new traits arise from just the right combinations of random genetic changes that, while extremely rare, do happen given enough time. Some DNA mutations don’t cause any obvious change to an organism at all. Other mutations are incredibly harmful, like the mutations in the human BRCA1 gene that make some people susceptible to breast cancer. But once in a very long while, beneficial genetic changes occur that make an organism fitter, happier, more productive… each new generation has a chance to explore new improvements. The DNA mutations responsible for new traits occur randomly, even when there is no selection pressure. For example, your gut contains antibiotic-resistant bacteria. The antibiotic resistance is a trait conferred by genes, which experience random mutations all the time. If you’re healthy and not taking any antibiotics, those resistant bacteria have no advantage over any other strain. They remain, but in low numbers relative to all other bacteria present. Once you begin antibiotic treatment, these mutants have the advantage. If everyone else is being killed off, they can thrive, “sweep” through the population, and replace other strains. Identifying other drivers and consequences of microbial evolution is an active area of research that intersects medicine and evolutionary biology. Microbes have profound effects on their host’s health, but they don’t have the same limits as their hosts. They reproduce much faster, exist in vastly greater numbers, and even swap genes around in ways humans can’t. They also, as Richard Lenski’s work shows us, help us wrap our primate brains around the seemingly impossible task of understanding how evolution actually works. Darwin himself, with his tape measure and bird beak collection, could really only demonstrate that evolution happens. 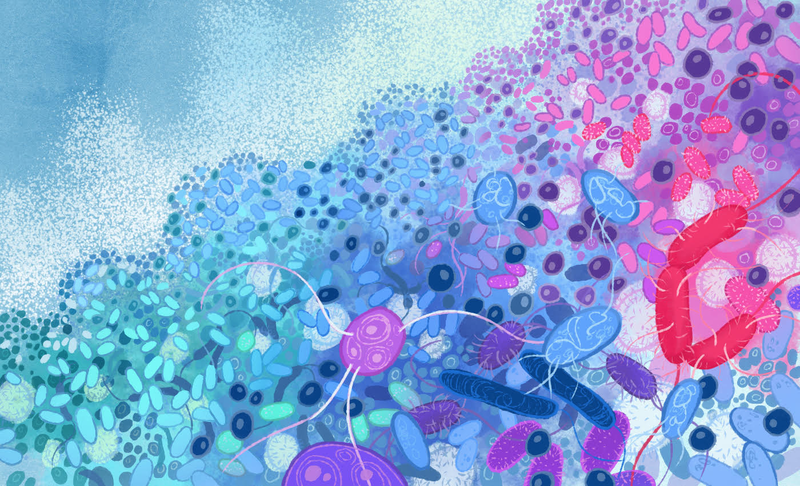 Understanding how it happens, and what it might bring for us next, is this generation’s task — with the help of some microbes. It may be hard for any one person to appreciate that evolution is an ongoing process, but remember that one year of your life is many generations worth of opportunities for your microbiome, and you, to evolve. I Contain Multitudes is a multi-part video series dedicated to exploring the wonderful, hidden world of the microbiome. A Curriculum Fellow at Harvard Medical School, passionate about improving undergraduate education, saving coral reefs, and eating spicy food.